If you have ever taken the Zion Park shuttle bus past the Canyon Junction stop, have you ever noticed that the scenery seems rather bland until you get to Court of the Patriarchs? That's because your view of the majestic 2000-ft tall mountains is being blocked by a massive landslide that dammed up the main canyon several thousand years ago. (The landslide was caused by a large piece of the Sentinel mountain collapsing.) In April 1995, a smaller landslide off of the "sand bench landslide" trapped tourists in the canyon for several days. The Sand Bench Loop is the not-very-loved trail that takes you to the highlands on top of the landslide slide and offers some good views of the surrounding mountains and the main canyon road below. Elevation Change: gradual 200-ft ascent to top of the sand bench. Seasons: Year-round. Spring and fall are most pleasant; summer can be very hot. The Sand Bench Loop starts at the Court of the Patriarchs shuttle stop and is roughly 3.5 miles (round trip). From the shuttle stop, cross the main road and walk the access road to a large water tank and the hikers' bridge across the Virgin River. The trail initially heads west to offer a good view of the Court of the Patriarchs, then it heads south and crosses a small stream, then climbs to the top of the landslide. 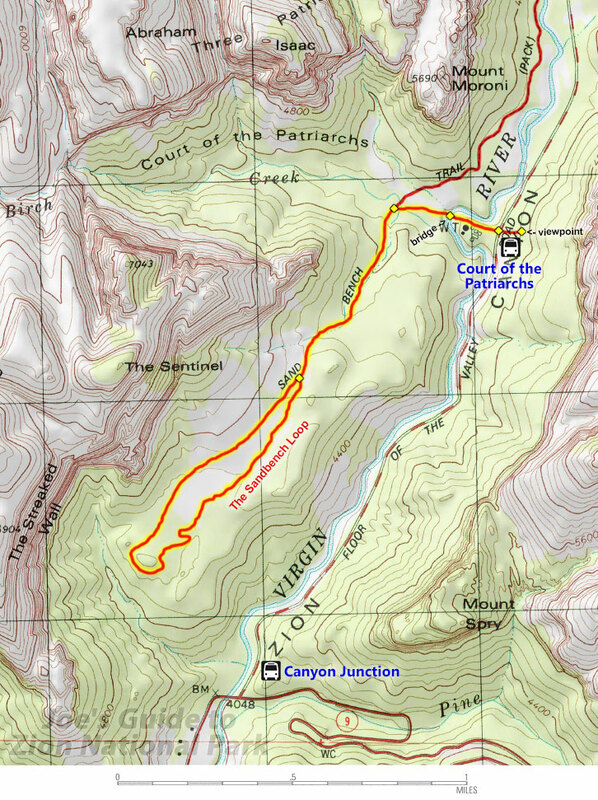 (From the Court of the Patriarchs, a small spur trail also heads north to connect with the Zion Lodge/Emerald Pools trailhead.) Total elevation gain up to the top of the sand bench is roughly 500 feet, much lower than any hikes to the canyon rims. Be sure to do the entire loop as both parts of the trail offer unique views. The eastern trail is more rocky with many interesting boulders scattered about and good views of the main canyon and the road below. The western loop of the trail offers amazing unobstructed views of the actual ancient landslide. If you like horseback riding, this is the way to do this trail in style during the summer months! 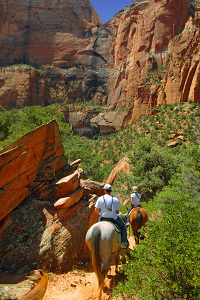 Currently the concessionary horseback ride provider is "Canyon Trail Rides" -- please see their website for more information: www.canyonrides.com. The 1/2 Day Trip (3 hours on the Sand Bench Trail) is a great diversion for $90 a person (as of 2018). It is a very fun time through some beautiful scenery. Tell them that "Joe's Guide to Zion National Park" sent you so they can say "Huh? Who or what is that?" This trail is not a destination hike and it could potentially be a miserable experience on a hot summer day. 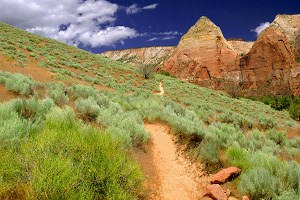 Although it is an official trail in the main canyon, sand, heat, and horse dung could make this less than pleasant. So pay for a ride and let a horse or mule do all of the work for you! Alternatively, if you really want to hike this trail, choose a cloudy or colder day for a more pleasant experience.